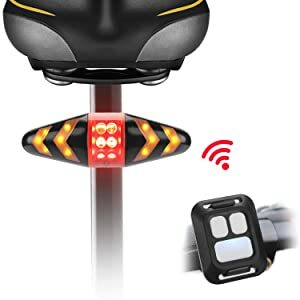 🚴 Smart brake Wireless Remote control bike light, The middle button on the remote control can control the red LED warning light of the tail light, and the left and right buttons respectively control the yellow LED direction indicator on the tail light. 🚴 2-in-1 Design, easy to be used as taillight (flash/steady on) and turn signal light (left/right). 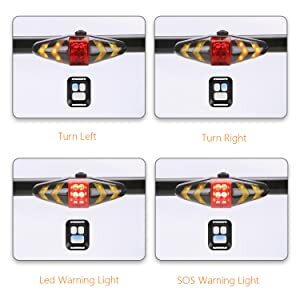 Mainly uses turn light, LED warning light, SOS warning light ect, Total of 11 LED light modes. 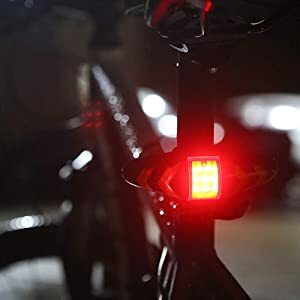 🚴 Safety LED flashing bike tail light, high quality Bright LED tail lamp, high intensity, guarantee the warning effect, Ideal Bicycle accessories. 🚴 Easy Installation for Kids Men Women, two sizes of rubber ring, suitable for all sizes of handlebars. 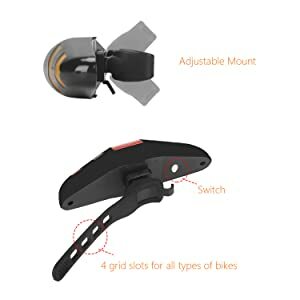 Detachable mount bracket, easy to use at bike bag or backpack. 🚴 IPX2 Waterproof, especially suitable for night riding and low visibility, guarantee daily use. Powered by 2 AAA batteries (included). High quality remote control bike turn signal LED rear light is used for night, such as cycling,road emergency and camping. Hook onto your belt, running gear, backpack, dog collars, harnesses, stroller, wheelchair or anywhere you can imagine, the turn flashing indicator warning function greatly enhanced the safety factor for night driving. Bike turn light function: 1. Remote Control: A total of 3 buttons, each button is equipped with an indicator light. ①Left turn button: Press the left turn button, the button indicator flashes, and the rear Light left turn indicator flashes, Press again to turn off. ② Right turn button: Press the right turn button, the button indicator flashes, and the rear Light right turn indicator flashes, Press again to turn off. ③ LED light button: Press the LED button, the button indicator is always on, and the red light in the tail lamp is always on. Press the LED button again, the button light flashes, At the same time, the red warning light in the middle of the taillights flashes. The button light is off, and the tail lights red warning light is off. 2. Tail lights construction: a switch button, red LED warning light, yellow LED turn indicator light. 3. Tail lamp operation method: ① Use the screwdriver and turn on the back cover of the taillight. Then insert the two AAA batteries according to the battery polarity sign, After installing the rear cover of the taillight, lock it with screws. ②Hold the tail light switch button until the LED light blinks, then use Remote Control to pair. ③Combine the tail light and the remote with the corresponding fittings, and then fit them into the appropriate position. ① Use the screwdriver and turn on the back cover of the taillight. 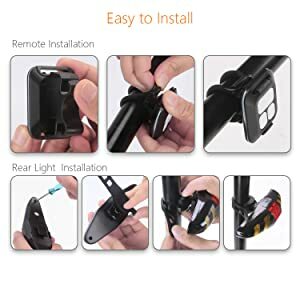 Then insert the two AAA batteries according to the battery polarity sign, After installing the rear cover of the taillight, lock it with screws. ②Hold the tail light switch button until the LED light blinks, then use Remote Control to pair. ③Combine the tail light and the remote with the corresponding fittings, and then fit them into the appropriate position.